Throughout the 1920s & 30s many men were skilled craftsmen and prepared to carry out much of their car repair and maintenance; also to help someone not so mechanically minded. The cost of garage repairs, and servicing, was another factor when wages were low. Additionally the motor manufacturers were not, at that time, insisting that any repair, and servicing, work on cars had to be undertaken by their approved dealerships in order to preserve the warranty on the car. They sold genuine parts to allow the owner to carry out their own work and the store-man was often able to give advice on how to dismantle and fit the parts purchased. The manufacturer's in-house magazines and the monthly motoring magazines, eg. Practical Motorist, The Light Car and The Motor magazines, published technical articles of a specific, or general, nature to provide the information that enabled everyone to try their hand at most tasks. The magazines continued to offer technical articles during the post-war years into the 1950s as owners tried to keep their pre-war cars going, or new owners purchased second-hand pre-war cars as their first step into car ownership. This section reproduces a number of general articles, most of which are not specifically 'Austin Seven', which apply to many pre-war, and early post-war, cars where the advice offered is as relevant now to owners of Austin Sevens as it was when the article was first published. Original Copyright: The articles from magazines included in this section are published in accordance with the Copyright, Designs and Patents Act 1988, which is the current UK copyright law. They are covered by the Act as typographical arrangements of published editions of Magazines, periodicals, etc. for which the copyright exists for 25 years from the end of the calendar year in which the work was first published. Hence, an article published in May 1988 may be copied as being free of copyright from the 1 January 2014, (ie 1 January 1989 + 25). For books the period is 70 years. Please note: The technical advice and information given in these articles is that of the original author and the publication cited. The Cornwall Austin Seven Club, its officers and members do not necessarily endorse the advice given in these articles, and do not accept any liability for loss, damage or injury from persons acting upon that advice. Anyone following the advice given in any of these articles, shall be deemed to have accepted this statement. Our technical members are only able to answer questions relating to the Austin Seven (1922-1939) and may not be able to answer any questions arising from these articles as they may have developed their own method of undertaking the work. Articles specific to the Austin Seven are in Austin Seven Handbooks; also sections of The Austin Service Journal produced by The Austin Motor Company Ltd. and issued to their Agents & Service Depots. Articles written by our members are in Technical Articles. You may wish to consider referring to The Austin Seven Manual. Fully recommended for the d-i-y enthusiast. This is an all embracing workshop manual covering 'Seven' models from 1925 to 1939, but does not adequately cover the 'Big Seven'. The sections deal with the Engine; Fuel System; Gearbox; Prop Shaft; Rear Axle; Front Suspension; Steering; Hubs & Brakes; Road Springs; Chassis; Electrical, and Accessories. Each section is divided into periods ie 1923-28, 1928-1932, 1932-35, although not always these years. Within each section are subsections on Dismantling and Assembly. Diagrams support the step by step easy to follow text, but the only problem is that the text does not cite the letter identifying the part in the diagram, so there is a need to have a reasonable technical knowledge in order to use it. by the late Doug Woodrow, published by and available from Mercury Vintage Services, Rosedale, Station Road, Emneth, Norfolk PE14 8DL. Tel: 01945 430058 e-mail: woodrow@mercuryvintage.freeserve.co.uk. copy of any article from an old magazine which is reproduced here. Articles so far: More articles are added as they become available. The Austin Seven - Part 2 The Braking System and Transmission. From The Light Car, May 28 1937. Carburettors Explained From Practical Motorist and Motor Cyclist, June 1954. Care and Maintenance of an Austin Seven From The Motor, June 14 1927. Centrifugal Ignition Control From Practical Motorist and Motor Cyclist, December 1955. De-coke the Side-valve Engine From Practical Motorist and Motor Cyclist, July 1955. 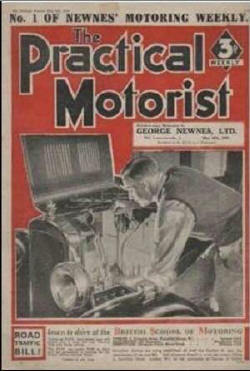 Difficult Starting From Practical Motorist and Motor Cyclist, November 1955. Engine Bottom Half From Practical Motorist and Motor Cyclist, August 1955. Engine Runs-on From Practical Motorist and Motor Cyclist, July 1955. From Practical Motorist and Motor Cyclist, August 1954. Rear Axle Overhaul From Practical Motorist and Motor Cyclist, October 1954. Refusal to Start From Practical Motorist and Motor Cyclist, September 1955. Relining the Brake Shoes From Practical Motorist and Motor Cyclist, June 1954. Removing Gudgeon Pins From Practical Motorist and Motor Cyclist, August 1954. Repairing Wire Wheels From Practical Motorist and Motor Cyclist, October 1954. Ride Comfort From Practical Motorist and Motor Cyclist, June 1955. Rosengart Austin Seven From the Light Car and Cyclecar Magazine June 27,1930. Semaphore Indicator (Trafficator) Problems From Carrycurrent Chronicle Vol 2, No 1 December 1935. Transmission Judder From Practical Motorist and Motor Cyclist, November 1955. Tuning an Austin Seven From The Motor October 6 1943. Upholstery - Repair and Renovating From Practical Motorist and Motor Cyclist, June 1954. Wear in Pistons, Cylinders and Pistion Rings From Practical Motorist and Motor Cyclist, September 1954. Wiring Diagram Simplified From Practical Motorist and Motor Cyclist, September 1954.